These Roasted Mushrooms with Garlic and Rosemary are loaded with a savory mixture of herbs and then baked until golden. Fast, fresh and easy to make, these mushrooms take less than 30 minutes from start to finish! When I was in college, my friends often teased me about my lack of domestic skills. You know…cooking, cleaning, that sort of thing. Which is really funny (and pretty unbelievable now) that I was like that years ago because now, I feel like I rule the kitchen and house. Not that I’m all-knowing, but that I love to be in the kitchen…cooking, baking, recipe testing, etc. And that’s pretty obvious, right? I mean, I do have a food blog and all. And cleaning! I love to clean! Yes, I’m one of those weirdos who enjoys cleaning the house, especially my kitchen. I make sure it’s spotless and sanitized every day. Although I didn’t cook much in college (does toasting a bagel for a sandwich or heating a can of soup count? ), there was one dish that I did cook every once in a while. And I’m not sure if you would even call it “cooking” but I loved to saute some mushrooms in butter and have it for dinner. Sounds weird, I know, but I was and still am a mushroom fantastic! I didn’t eat them too often growing up, but now that I can make them on my own, I try to sneak them in whenever I can. That can be tricky since the hubster isn’t the biggest fan of mushrooms, though he will eat them on pizza and in chicken marsala (go figure, right?). But, that’s ok, because it means ALL of the mushrooms are for me. And that’s a win-win all around. And now that my taste buds have evolved and I’ve learned my way around the kitchen, I’ve experiment with different ways of preparing mushrooms. 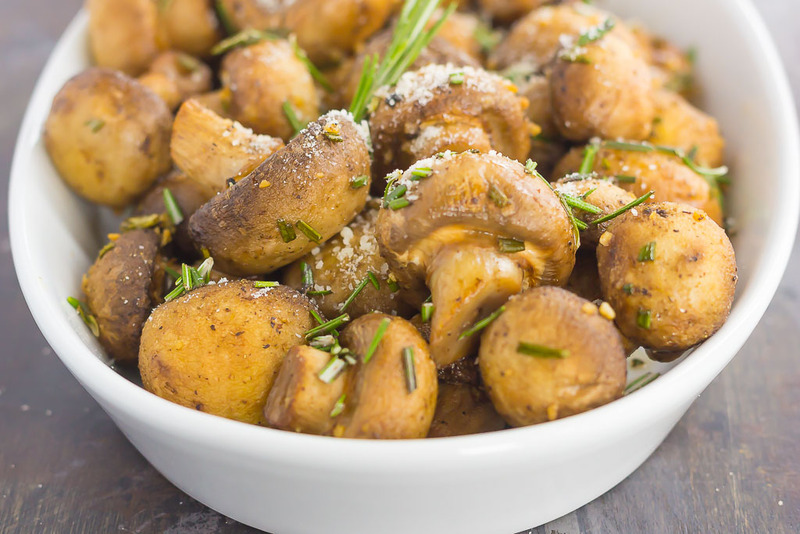 I have to say that these Roasted Mushrooms with Garlic and Rosemary are my new favorite way to eat them. It’s actually quite surprising that I don’t have more mushroom recipes on Pumpkin ‘N Spice, as it’s my favorite veggie (followed closely by asparagus). Well, I’m changing that today, friends, and I might just have another recipe or two up my sleeve. I mentioned that I used to saute mushrooms when I was in college. I still do, but I also love to roast them. And since I’ve been on a roasting kick lately (remember these Roasted Lemon Garlic Green Beans? ), it only seemed natural that I roast these babies. 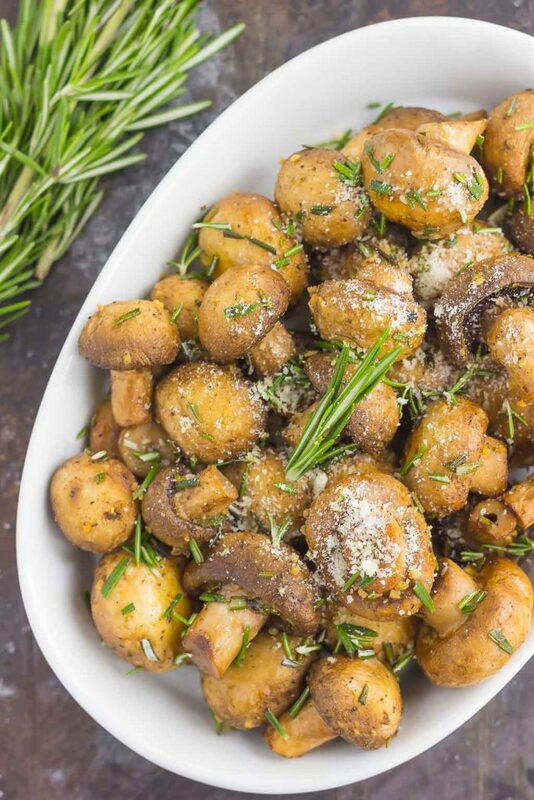 If you’re a mushroom lover like I am, then I guarantee you’ll go crazy for these Roasted Mushrooms with Garlic and Rosemary. 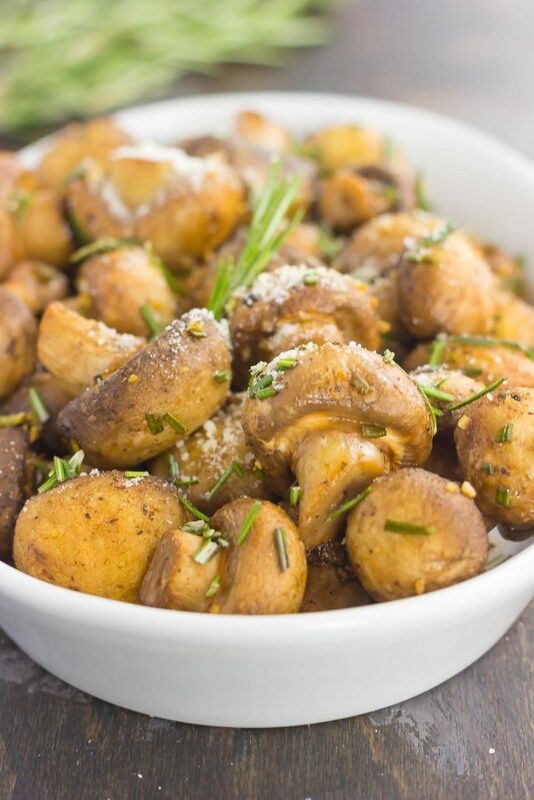 The mushrooms are tender, slightly caramelized, and loaded with garlic, fresh rosemary (my favorite herb! ), thyme, salt and pepper. So flavorful and so delicious! And the prep time couldn’t get any easier. Simply mix together some olive oil and the spices, then toss them together with the mushrooms and pop ’em into the oven. I sprinkled on some grated Parmesan cheese for garnish, just to make them extra special, but feel free to leave out the cheese if you prefer. So if you’re looking for a new roasted veggie, these Roasted Mushrooms with Garlic and Rosemary are it! Looking for more vegetable side dishes? I’ve got you covered! Preheat oven to 400F. Lightly grease a large baking pan with non-stick cooking spray or line with parchment paper. Set aside. In a large bowl, combine the olive oil, minced garlic, rosemary, thyme, salt, and pepper. Add the mushrooms and toss, ensuring each mushroom is coated. Spread mushrooms in an even layer on prepared baking pan. Bake for 18-20 minutes, or until mushrooms turn golden and start to caramelize. Remove from oven and garnish with grated Parmesan cheese and fresh rosemary, if desired. It is the cutest thing that you made sautéed mushrooms for dinner in college! The closest I ever got to cooking was ramen in my hot pot (do they even exist anymore?) and maybe tuna on crackers! I adore this recipe! Mushrooms have always been a favorite of mine! Have a great day, Gayle!! I did my fair share of ramen cooking, too, although I think I mostly just ate those ramen noodle cups where you add water and microwave it! :) Thanks for the kind words, Annie! Gayle, believe me, I wasn't the best cook years ago. Boy, oh boy, did I make some disasters! Funny when I think about it now. I remember when hubby and I were dating and he said to me, 'I love your lumpy gravy.' Oh man! Too funny! I still remember that. But, I like to think I've grown a lot since then and know my way around the kitchen. You definitely know your way around the kitchen too with all the delicious recipes you share!! And these mushrooms? Big fan of mushrooms too and I think I always have been. I adore rosemary as well and grow it in the garden in the summer time (grows really well around here). I would definitely be putting some cheese on these mushrooms too....cause cheese, right ;)? Pinned, of course! Have a wonderful week, my friend! Lumpy gravy...I love it! It just shows you how far you've come, right? Plus, it's a funny story! :) I bet fresh rosemary from your garden is perfect. I'm planting a garden this year, so I will have to remember to do a herb one as well. Thanks for the mushroom love and pin, Dawn! Waaaait wait wait. You LOVE to clean?! There is a house I know of that you can clean anytime your little heart desires... MINE. :) I pride myself on being a good friend, so I just want to make sure you know I support your love of cleaning... and I'm happy to provide a house for you to clean. LOL! <3 Anyways, I am loving these mushrooms, girlfriend! I'm kinda picky about mushrooms, and I don't love them in everything, but these 'shrooms?! I'm ALL about! 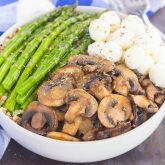 You know I'm a garlic fan right there with you, so I love that you used it with these mushrooms! Such a scrumptious side, my friend! Pinned of course! Cheers! Bahaha I'll keep your house in mind if I ever want to go on a cleaning binge! Thanks for the support! :) And for the mushroom love and pin, too! Garlic makes them extra delicious, right?! I wasn't much of a homemaker until I got married and had kids, so you're definitely not alone. There were a lot of toasted bagels consumed in my college days, too! These mushrooms sound amazing. I'm a huge fan of cooking mushrooms with butter, and I could seriously eat them as the main course of dinner multiple times per month. Perfect! Aren't mushrooms the best?! I think butter really adds that extra touch. And glad I'm not the only one that wasn't too home-savvy in earlier in life! :) Thanks for the sweet comment, Blair! Funny how times change isn't it? I was exactly the same way. I liked to bake, but cooking and cleaning not so much. And mushrooms are something I eat almost daily. I toss them into everything! Needless to say, I could plow through this entire serving myself. 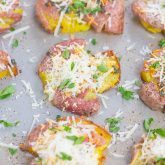 They look so delicious and I love the garlic and rosemary flavors! It is funny how things change! And I'm so glad you like mushrooms just as much as me. I'd have to say they're my favorite veggie. Thanks for the kind words, Marcie! LOVE this! If this dish were in front of me at the Easter diner table, this is all I would eat. and i love the herbs you chose. Well good for you girlie to enjoy cleaning! I'm sure your family doesn't mind! I don't mind putting things away, but trying to clean off the stove is the worst! I can just never get it just right! I agree...the stove is the worst to clean! And I hate cleaning the microwave, too! It is funny how times change for sure! We should have a mushroom, pb, and organization party...how fun would that be?! :) Thanks for the sweet comment and pin, friend! I can totally relate, I did not cook while in college! Same for cleaning and house work, which I love doing now. Love mushrooms, can't wait to try these! So delicious! Isn't it funny how time changes things? Thanks for the mushroom love, Mira! these look just fantastic Gayle! I love mushrooms and I bet the garlic and rosemary went so well here! Thank you, Manali! I love the flavors together! haha, love it! We do rule the kitchen and house!!! love this mushroom dish! I could eat the entire bowl! haha I'm with you - I kinda sorta like to clean. There's just something about everything feeling all fresh! ANYWAY. 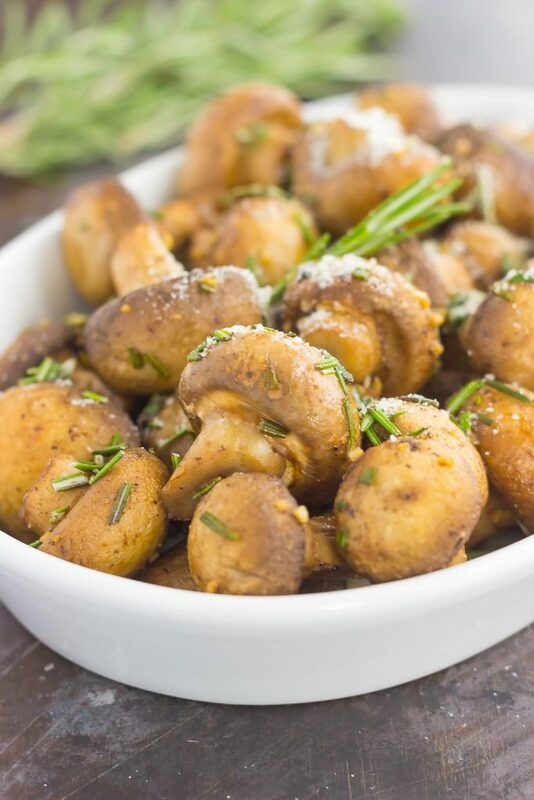 I love mushrooms and these sound sooo good - rosemary is a favorite of mine! Hooray for cleaning! :) Thanks, Ashley! Since I started blogging in high school, I was definitely the domestic one in college! Haha, everyone knew to keep the kitchen clean for me, and they'd be rewarded with baked goods :) but when it came to actually cooking, not baking, I was pretty lame! 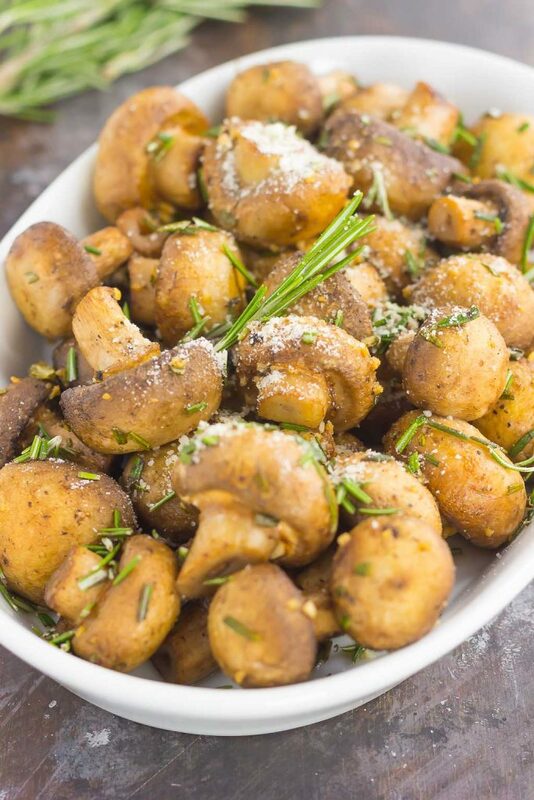 These mushrooms look sooo good - anything with garlic and rosemary gets a big thumbs up from me. That's awesome that you were the baked goods queen in high school! And yay for anything with garlic and rosemary! :) Thanks, Rachel! Mushrooms are absolutely mu cup of tea and I usually fry them. Next time I am trying your recipe and roasting them, Gayle! Thanks for the sweet comment, Agness! Lol, I am totally the same way about cleaning. The kitchen has to be scrubbed down clean right before I make a big mess out of it and then I do the same thing right after - it drives my husband bonkers haha! Love these roasted mushrooms! The garlic and rosemary combo sound perfect! Haha YES! It's a vicious cycle, right? :) Thanks for the kind words, friend! 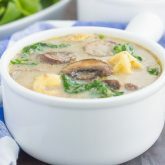 I have to say, I am not a mushroom fan, but my mom is and I know she will love this recipe, so I am emailing it to her Right This Minute! Thanks, Kate! Hope your mom loves this! Thanks for the sweet comment and pin, Milena! 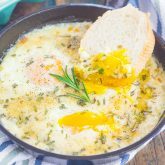 You will love mushrooms and rosemary together! And I agree, butter is the best with mushrooms! I am not a huge mushroom fan - however, I reallllyyy wanna sink my teeth into these!